Hurricane season is upon us. The time to prepare is BEFORE a storm even happens. There are many things you can do to protect your family and be safe, but that means planning ahead. What (few) personal items do you want to have ready for your 'go bag' if told to evacuate? If the storm changes directions, you may only have hours to react. Plan ahead! Decide if you will stay or evacuate. DO NOT PUT TAPE ON YOUR WINDOWS. It doesn't work to prevent the glass from shattering/breaking and will damage the windows in the process. Brevard Emergency Management will open shelters when needed. Click Here for current shelter information. Talk to your kids so they know what to expect. Community of Hope will add updates to this website, so if you evacuate you will know what happened to your home. 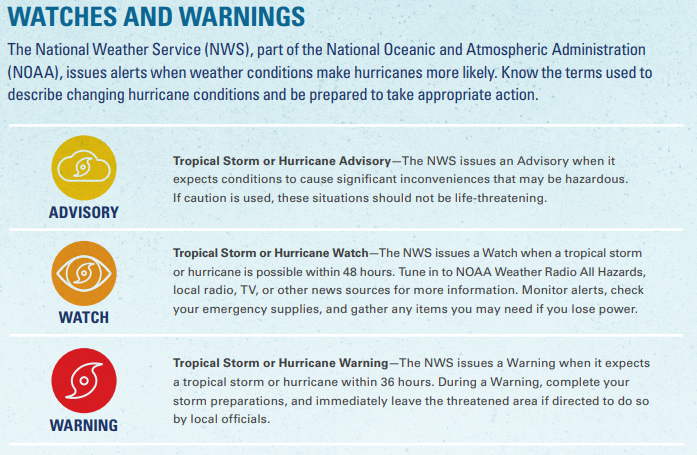 These are just a few of the dangers that lurk outside even after the storm has passed. Wait until emergency services has given the 'all clear' signal on the radio, or you can check here on the website for updates as we get them.